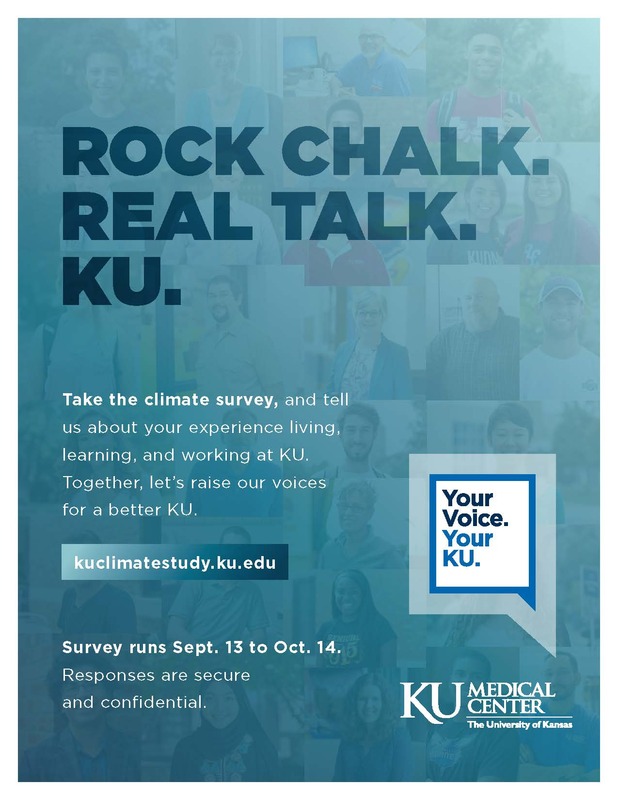 Why is KU conducting a climate survey? This idea originated from interested students, faculty and staff who believed data from such a survey might be useful in planning for the future and improving the KU climate. They first identified the need to conduct a campus climate survey in December 2014. In 2015, KU and KUMC faculty, staff, students and administrators explored options and identified the best team in the country to help us engage in this critical process. Climate is the collective atmosphere that either helps us succeed or holds us back. It's everything from policy to personal attitudes in the classroom, the residence hall, the dean's office, the laboratory and the paint shop. The climate is often shaped through personal experiences, perceptions and institutional efforts. The consultant we are working with, Dr. Susan Rankin of Rankin & Associates Consulting, puts it this way: university climate is "the current attitudes, behaviors, standards and practices of employees and students of an institution.” We seek to create a positive climate at KU because that leads to successful outcomes: healthy identity, productivity, a sense of value, and overall well-being for all. 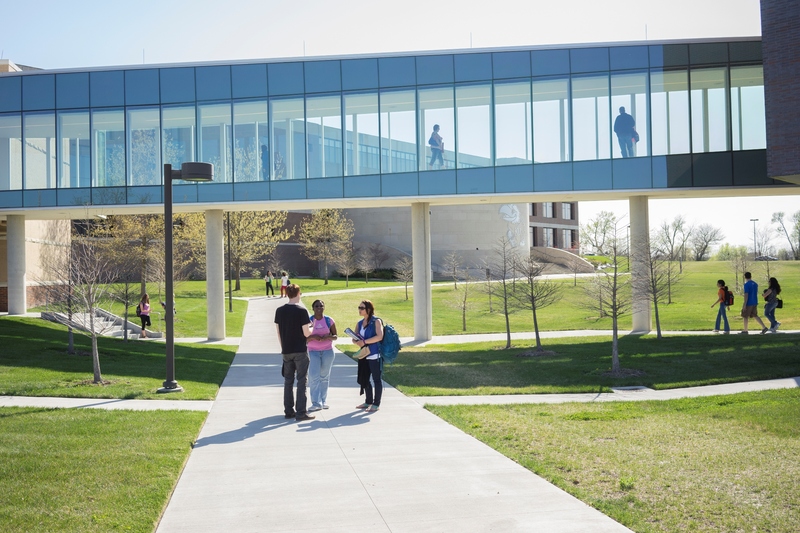 The Campus Climate Steering Committee (CCSC), which includes a cross section of students, faculty and staff, is charged with conducting KU’s climate survey. The committee selected Rankin & Associates Consulting to conduct the survey. Rankin & Associates reports directly to the committee. Dr. Rankin is an emeritus faculty member of Education Policy Studies and College Student Affairs at The Pennsylvania State University and a senior research associate in the Center for the Study of Higher Education. Dr. Rankin has conducted multi-location institutional climate studies at more than 150 institutions across the country. The consultant has administered climate assessments to more than 150 institutions across the nation and developed a repository of tested questions. To tailor the survey for KU and KUMC, and to capitalize on the many assessment efforts already underway, the Campus Climate Steering Committee (CCSC) was formed and consists of faculty, staff and student representatives from various constituent groups at KU. The committee is responsible for developing the survey questions. The team will review selected survey questions from the consultant’s tested collection, and will also include KU-specific questions which will be informed by results of focus groups. 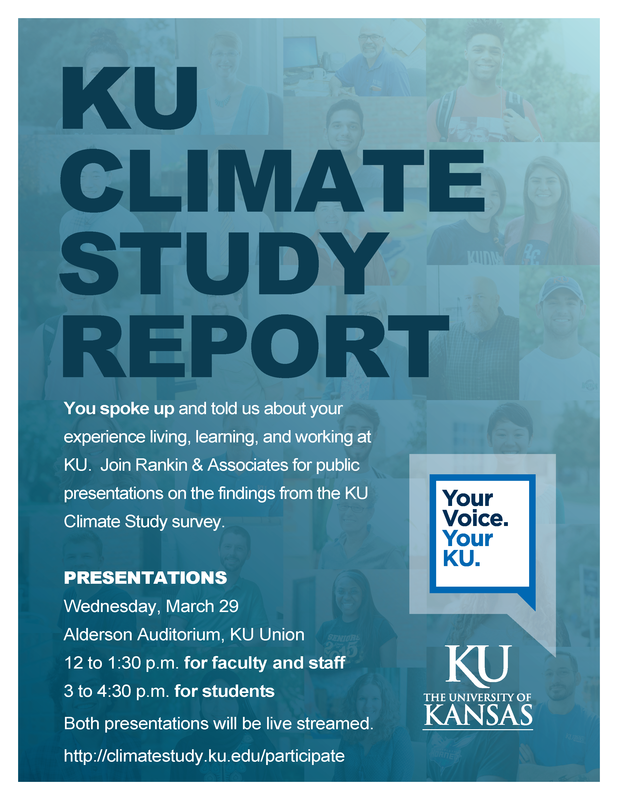 Although the committee believes the survey process itself is informative, we have sought and received commitment from senior leaders that data will be used to plan for an improved climate at KU. All stakeholders—faculty, staff and students—will be invited to participate in the development of post-survey action initiatives. KU and KUMC will receive data (without identification) and reports to inform the development of action steps. What is the response rate goal? Target participation in the survey is 100%. Every response matters and is valuable in providing the most beneficial feedback and results. Is it confidential? What if I don't want to answer a question? Confidentiality is vital to the success of campus climate research, particularly as sensitive and personal topics are discussed. The consultant will take multiple precautionary measures to enhance individual confidentiality. No personally identifiable information will be shared. The consultant will take additional steps to ensure responses are not identifiable to an individual before providing the data and reports to KU and KUMC. Participation in the survey is completely voluntary, and participants do not have to answer any question— except the first positioning question (staff, faculty, student) —and can skip any other questions they consider to be uncomfortable. Paper and pencil surveys will also be available. The climate study survey uses Rankin & Associates, not KU, to collect and analyze all responses. Confidentiality is offered by ensuring that specific responses with fewer than five individuals for that response are not reported to KU. Open-ended answers are de-identified, meaning all written responses are split from any identifying group or demographic information of the author. In addition, before the final report is delivered, Rankin & Associates will have a small workgroup from the Campus Climate Steering Committee review all comments to make doubly sure they are not linkable to an individual. If any are found, they will be removed from the final report. Why was a non-KU researcher selected for the project? Dr. Rankin recommends against using random sampling as we may miss particular populations where numbers are very small (e.g., Native American faculty). Since one goal of the project is inclusiveness and allowing invisible “voices” to be heard, this sampling technique is not used. In addition, randomized stratified sampling is not used because we do not have population data on most identities. For example, KU collects population data on gender and race/ethnicity, but not on disability status or sexual orientation. So, a sample approach could miss many groups.